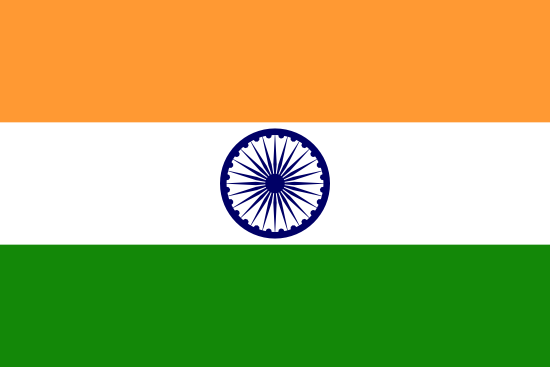 With a population of just over 1 billion, India is the world‘s largest democracy. Per capita income is over US $1000. In the past decade, accelerated economic growth, averaging over 7% per year, has brought significant economic and social benefits. Measured in terms of purchasing power parity, India has become the world‘s fourth-largest economy. Against this backdrop of progress and structural change, poverty and disparities in income and human development remain major challenges. Over 400 million people remain poor, and the prevalence of underweight children is almost double that of sub-Saharan Africa. People living in poverty, minorities, women, Scheduled Castes, Scheduled Tribes and Other Backward Classes (governmental classifications based on social and economic status) all have inadequate access to the resources and opportunities that would permit them to benefit from economic growth. India‘s development challenge is to make the country‘s continuing impressive growth substantially more inclusive. Among the constraints to achieving widespread participation in the growth process are tenure insecurity and inadequate enforcement of property rights. Women‘s land rights in India are not as secure as those enjoyed by men, and less than 10% of privately held land is in the name of women. The customary land rights of tribal people have been undermined by laws and other reforms, leading to a steady loss of their land. Conflicts over forests, agricultural lands and natural resources are pervasive, and in several central and northeastern states, such conflicts have contributed to the rise of a Maoist insurgency. Pressures on the natural resource base are increasing. Continuously falling per capita water availability and declining water quality are becoming ever more acute problems. Demands for wood, livestock grazing and agricultural land are exerting pressure on forests. These challenges are aggravated by tenure insecurity and lack of clarity in use-rights, both of which discourage resource conservation and investments to safeguard the productivity of the natural resource base. USAID and other donors can assist India in strengthening land tenure security and property rights governance in a number of strategic ways. Women have difficulty obtaining access to land, including through inheritance, and difficulty retaining rights to land. Under most past land reform efforts, women have not received rights on a par with men. USAID has announced its intention to focus on the needs of poor women and girls and has recognized that women‘s rights to land are significantly compromised in India. USAID and other donors could support the Government of India (GOI) in implementing a gender strategy in at least two ways. First, donors could support comprehensive research on the impact of agricultural tenancy laws, with special emphasis on the effect of such laws on women’s land tenure and livelihoods. The research would culminate with specific recommendations for legislative changes in each state or in a set of high-priority states. Second, donors could support a project to suggest specific amendments to state laws to equalize male and female inheritance rights. This could begin with research in states where rules provide for more equal treatment, with a focus on why such laws are not enforced and what kinds of public campaigns could be initiated to promote compliance. In India, most poor people are not aware of their legal rights to land and property, and have limited or no ability to access courts (and land administration officials) to assert and defend land claims. USAID and other donors could support new and expanded legal aid and legal literacy programs focusing on land rights. Such programs could be modeled on the successful Indira Kranthi Patham program in Andhra Pradesh. As poor rural women and Scheduled Tribe (ST) communities are perhaps least able to enforce their legal rights to land, these programs should emphasize the land rights of women and ST members. Land-related disputes dominate the Indian court system, creating backlogs that prevent just and timely resolution of disputes. USAID and other donors could support a project to create and expand alternative dispute-resolution programs to help alleviate backlog in land-related cases. To this end, USAID could build on its past projects that have focused on improving the administration of the justice system by supporting stronger community-level legal systems, training for justice sector personnel and improvements to court management (USAID 2002; USAID 2010b). The most recent systematically collected data estimating ST landholdings in India dates from 1961. Some scholars have attempted to estimate ST holdings since then, but recognize the limitations of such estimates. USAID and other donors could support a project to collect India-wide data on ST landholdings. India- wide data on ST landholdings would give a broad context to the numerous small studies on ST land rights and allow national tracking of ST land alienation. Despite extensive and longstanding state legislation restricting the alienation of ST lands, the loss of ST land continues, and scholars and researchers disagree about the role played by legislative restrictions on alienation and the proper course of action. The controversy itself reflects the need for comprehensive local research on the impact of the restrictions. USAID and other donors could support research into the application of laws that restrict alienation of ST land to determine whether these should be amended to respond to local circumstances. Based on the findings, officials can take appropriate actions at state and local levels to enhance restrictions, shore up enforcement programs, provide for legal services and judicial education, and, where indicated, consider methods to support the diversification of ST livelihoods. The Forest Rights Act of 2006 transferred substantial authority over forestry management to local ST communities. However, most states have not yet effectively implemented the law to this end. In other cases, local residents continue to violate provisions of the law to secure forest resources for household livelihood. USAID and other donors could support research on the impediments to implementation of the Forest Rights Act, with particular focus on the needs and roles of ST forest communities. India’s water resources are overused and polluted, leading to water scarcity and poor water quality. USAID and other donors could encourage the development of a sustainable water resources management policy that limits water for irrigation and encourages local management of water resources. In India nearly half of all land is degraded due to current agricultural practices, industrialization and other factors. USAID and other donors could work with the government at the national and state levels to further understand the causes of soil degradation and identify possible remedial and preventative measures. Specifically, donors could support research on best practices for soil restoration and conservation to identify appropriate solutions, which could include conservation agricultural techniques, reclaiming brown fields, and preventing runoff from manufacturing. To nearly all of the 71% of Indians who live in rural areas, land is the most important household asset and determinant of wealth. At both the national and state levels, the Government of India (GOI) has made significant efforts to reduce rural poverty by reducing insecurity of land-tenure and making access to land more equitable. Land reform in India has had some positive benefits, but much remains to be done. India’s urban population is the second-largest in the world. Across the country, millions live in slums (i.e. poorly serviced settlements lacking in tenure security) on the urban periphery. As urbanization increases, urban living standards are likely to fall as local governments struggle to meet demand for services. Residents of some slum settlements have been subject to mass forced evictions, particularly in areas slated for commercial development. Women’s land rights in India are not as secure as those enjoyed by men. Nationwide, less than 10% of privately held land is in the name of women. Even when land is titled in a woman’s name, her actual control over the land is limited. Rural women in particular have little access to or control over land. A majority of rural women depend on agriculture for their livelihoods, yet their access to and control of land is extremely limited. Laws governing forestland, as well as other reforms, have often undermined the customary land rights of tribal people. Tribes that the GOI officially recognizes are referred to as Scheduled Tribes and commonly referred to as ST communities. Land reform policies that extended some rights to ST communities have not prevented a steady loss of ST land due to land development, conservation and the illegal alienation of ST lands to non-tribal people. As a result, many families in tribal areas lack any rights to the land that they have occupied for generations. Disputes over land and natural resources are pervasive in India. The courts are clogged with unsettled land disputes. In the eastern and northeastern states of India, conflicts over forests and agricultural lands have their roots in longstanding inter-communal, ethnic and separatist conflicts. In ST areas, disputes related to the illegal alienation of ST land to non-tribal people are common. In several central and northeastern states, large companies have purchased land and mineral rights from state governments, which has contributed to the growth of a well- armed Maoist insurgency known as the Naxalites. Water supply problems and water pollution in India are acute. Unregulated groundwater-pumping drains public water reserves and depletes water tables. Per capita water availability in India has fallen since the country gained its independence in 1947, and will probably continue to decline. In addition, water quality is negatively affected by industrialization, agrichemicals, erosion, soil degradation, domestic pollution and wetland degradation. The demands of human development (wood, livestock-grazing and agricultural development) have exerted severe pressure on India‘s forests. Development needs since Independence have created a large and growing demand for wood products. A shortage of productive irrigated agricultural lands in non-forest areas has led to mounting levels of forest encroachment by cultivators. India has rich mineral resources and is a major producer of minerals. Mining and quarrying accounted for 2% of GDP in 2005. Coal mining accounts for 70% of employment in the mining sector. However, the mineral sector has given rise to conflict and environmental problems. India has a total land area of 2,973,200 square kilometers and a 2008 population of 1.1 billion people. Agricultural land comprises 61% of total land area, and approximately 33% of India‘s cropland is irrigated. Arable land accounts for 53% of the country‘s total land area. Over 6 million hectares of land are considered wastelands, which are either completely barren or significantly under-producing. The GOI further classifies India‘s national land-use as follows: 47% sown; 23% forests; 8% fallow; 8% non-agricultural; 6% barren and uncultivable; 4% cultivable wasteland; 3% permanent pastures and other grazing land; 1% miscellaneous tree crops and groves. Although officially classified grazing land comprises only 3% of the national land area, in fact over 50% of the land area – including forest land, fallow land, barren land and wasteland – is occasionally or seasonally used for grazing (GOI 2009b; World Bank 2009c; FAO 2008; Hanstad and Nielsen 2007; Kushwaha 2008). The Northern Mountains. This zone contains the Himalayas, as well as fertile valleys and arid, cold deserts. The Indo-Gangetic Plains. Three river systems, the Ganga, the Indus and the Brahmaputra, frame the Plains region, which contains vast stretches of fertile, alluvial soil as well as areas of desert. The alluvial stretches are among the most densely populated areas in the world. The Deccan Peninsula. The Deccan zone covers all of southern India and is highly populated. The Coastal Plains and Islands. This zone includes the Eastern and Western Ghats, as well as the eastern and western coastal plains. This area is densely populated. Conversion of agricultural land to non-agricultural uses is widespread in India, and is caused by ongoing and rapid processes of industrialization and urbanization and reduced economic incentives to engage in agriculture. Also, forest and grazing lands have often been converted to cropland, from which they is more easily convertible to industrial and commercial uses (GOI 2009a; Kushwaha 2008). India‘s GDP in 2008 was composed of 18% agriculture, 29% industry and 53% services (World Bank 2009). Seventy-one percent of Indian residents live in rural areas and 29% live in urban areas. Approximately 70% of India‘s rural population is engaged in agriculture, with women providing more than half of all agricultural labor (World Bank 2009c; FAO 2008). India‘s geographic and climatic variation (including mountains, plateaus, rivers, forests, deserts, wetlands, lakes, mangroves, coral reefs, coasts and islands) makes it a biodiversity hotspot. Protected areas comprise 5.1% of India‘s land area; slightly less than 23% of India‘s territory is forested (Library of Congress 2004; World Bank 2009c; GOI 2009b). India‘s population has tripled over the past 50 years, but its total amount of cultivated has increased by only slightly more than 20%. Most of the increase in cultivated area has come from encroachment into forest and grazing lands. In India, nearly 17% of the world‘s population now lives on approximately 2.4% of the world‘s land. Although India has a greater percentage of land in agricultural use than most countries, it has relied on increasingly intensified agricultural practices to meet its domestic food needs (GOI 2009b; Kushwaha 2008). Land-use practices, combined with natural forces, have led to severe soil degradation in many parts of India. Intensive agricultural production practices during the Green Revolution relied on excessive use of water and fertilizers, resulting in water-logged and salinized soils, as well as contaminated runoff and groundwater pollution. Soil erosion is an ongoing problem in India due to cyclones, flooding, environmentally unfriendly agricultural practices, increasing consumption, industrialization and other factors. The GOI estimates that 147 million hectares (2005–2006 data) have been degraded due to a combination of the above factors (GOI 2009b; Kushwaha 2008; Library of Congress 2004; World Bank 2009c). ST communities comprise 7% of India‘s population. ST members are among the poorest and most politically marginalized people in India. Their economic circumstances are often closely linked to land and forestry resources (IDMC 2010; Hanstad and Nielsen 2007). India‘s urban population is expected to reach 550 million in 2021, and land-use issues have become more acute as populations have grown. An estimated 44% of India‘s urban residents currently lives in slums. According to the GOI, urbanization has been both rapid and uncontrolled, resulting in: (1) environmental degradation; (2) housing shortages; (3) decreased water quality; (4) air and noise pollution; and (5) inadequate sanitation, sewerage and waste disposal systems. Improperly disposed industrial effluents, along with poorly managed domestic and municipal wastes, have resulted in extensive soil pollution from heavy metals (GOI 2009b; UN-Habitat 2010). Many of India‘s urban centers lack a sufficient land-use and planning framework to guide development and accommodate rapidly increasing populations. Impediments to improved urban planning include complex and overlapping bureaucratic institutions, as well as restrictive zoning regulations and overly structured master plans. The latter constrict the urban land supply available for development and reduce the ability of city governments to react flexibly to changing needs (GOI 2009b). The urban population, especially in India‘s largest cities – Mumbai , Kolkata, Chennai, Delhi and Bangalore – continues to rise. By 2001, approximately 38% of the country‘s urban population lived in 35 cities with populations over one million. As the large cities have grown larger, the smallest towns have grown smaller, and populations in the medium-sized cities have remained constant. The national government considers employment markets in the largest cites to be fully saturated and living conditions to be worsening. In response, the government plans to support the economies of small and medium-sized urban centers, to accommodate increased urban population growth and focus on improved urban planning (GOI 2009b; UN-Habitat 2010). At the time of Independence, India‘s agrarian system was semifeudal. In much of the country, large landlords and land tax collectors employed intermediaries to exact rents and fees from cultivators. Through these intermediaries, landlords demanded extortionate rents and sometimes subjected tenants to summary eviction. In the late 1940s, tenant farmers accounted for approximately 35% of India‘s rural population. Those who worked the land had little incentive to make investments in the land to increase productivity (Hanstad and Nielsen 2007; LRAN 2003a). In the years following Independence, Indian states enacted a series of land reforms intended to both improve equity in land distribution and improve efficiency in agricultural production. These reforms included: measures abolishing intermediaries; measures prohibiting or strictly regulating tenancy; maximum landholding ceilings, with excess land redistributed to the poor; and government allocation of Bhoodan land (nearly 16 million hectares of land donated to the state by landowners between 1951 and 1969), government wasteland (lands that are barren or under-producing), and house sites. These reforms succeeded in reallocating some of the land in India – 8.5 million hectares under tenancy and ceiling laws alone – from largeholders to the landless and land poor. However, the reforms were plagued by loopholes and faulty implementation, and actually harmed the poor in some instances, usually through unintended consequences. For example, to avoid the application of land ceiling laws and laws granting owner-like rights to tenant cultivators, many landlords evicted poor tenants and reduced the amount of land leased to tenants (Hanstad and Nielsen 2007; LRAN 2003a). Distribution of agricultural land in India remains uneven. Just 3.5% of all farmers own nearly 38% of all agricultural land. Although 58% of the population depends on agriculture for its livelihood, 63% of this group owns parcels smaller than one hectare, and less than 2% of this group owns parcels equal to or greater than 10 hectares (1999 survey data). Approximately 43% of all agrarian households are either absolutely landless or nearly landless (owning 0.2 hectares or less) (1999 survey data). These households are much more likely to be poor than those with land (GOI 2009a; LRAN 2003a; Hanstad and Nielsen 2007). 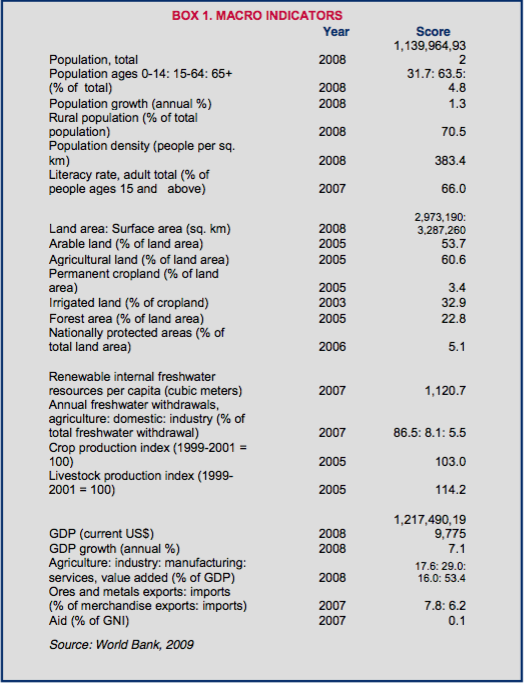 India has over 81 million hectares (about 27% of total land area) of common property land resources. The entire community has use-rights to such land, which includes pastures, ponds, cultivated land, drainage channels, house sites, barren land, burial grounds, village gardens and dense forest. Community wasteland (degraded grazing land, barren land, roadside strips, etc.) and forestland constitute the greatest proportion of common property resources. Common property is important to the rural poor, as it provides grazing land and water for livestock. The total area devoted to common property has been declining steadily due to urbanization, industrialization, development projects and distribution of common property resources to landless families (Hanstad et al. 2005; GOI 2009a). India has an ST population of approximately 68 million. ST livelihoods and culture are highly dependent on land. More than 90% of the ST workforce is engaged in cultivation, agricultural labor, animal husbandry and forestry. Land reform policies that extended some rights to ST communities have not prevented a steady loss of ST lands due to land development, conservation and the illegal alienation of ST lands to non-tribal people. Thus, most ST members are landless. ST communities have been displaced by development projects at a rate far higher than non- tribals. As a result, many ST families lack rights to the land that they have occupied for generations or have been forced to move from the land altogether (Hanstad et al. 2005; GOI 2009a; IDMC 2010). India‘s urban population is the second-largest in the world, with slum settlements developing on the periphery of most cities. Seventy-five percent of India‘s urban dwellers are in the bottom income segments and, on average, the urban population earns 80 rupees (less than US $2) per day. Approximately 80 million people live in slums; Delhi alone has 860 officially recognized squatter settlements that are home to 4 million people. As urbanization increases, urban living standards are likely to fall as local governments struggle to meet demand for public services (UN-Habitat 2003; MGI 2010; Wade 2010). Over 14 million hectares of agricultural land have been converted to non-agricultural land since Independence. The poor have not shared in the increase in value that usually accompanies conversion of land to non-agricultural use. Moreover, conversion by the GOI under the Land Acquisition Act deprives the owner of any share of the increase in value resulting from conversion (Hanstad et al. 2005; Hanstad and Nielsen 2007; GOI 2009a). Privately owned land is overwhelmingly held in the name of men. One survey revealed that, nationwide, less than 10% of privately held land was registered in the name of women. The extensive land reforms adopted throughout India since Independence have resulted in the formalization of community land, to which women usually have use-rights but men have title (GOI 2000; FAO 2008). In many parts of India, members of lower castes and certain religious groups, such as Muslims, have lower rates of land ownership and less access to land than other groups. While precise figures are not available, most dalits (members of the lowest caste) are either de jure or de facto landless. In urban areas, dalits often live in illegal settlements on the urban periphery. Although the rate of landlessness among dalits increased nationwide between 1994 and 2004, in West Bengal, land reforms aimed at benefiting marginalized groups have reduced landlessness among dalits (Khotari 2005; Ramaswamy 2006; Bakshi 2008; GOI 2009a). The Constitution requires each state to adopt its own laws on land administration and land reform and grants states exclusive authority to legislate land-tenure issues. Thus, individual state laws govern most matters pertaining to land. Key pieces of central legislation governing land include: the Land Acquisition Act (1894) and its state amendments, which permit the state governments to take land from private parties for a public purpose; the Transfer of Property Act (1882), which governs land sales; the Registration of Property Act (1909), which sets forth land title registration procedures; and the Panchayat (Extensions to the Scheduled Areas) Act (―PEAS ‖) (1996), the intent of which was to protect the tribal way of life and restore previously alienated ST lands. In addition, a National Land Reforms Policy provides a common national framework for all states to consider. States have their own laws for land recordkeeping (Hanstad et al. 2005; Hanstad and Nielsen 2007; GOI 2009a). After Independence, most states adopted various types of land-reform legislation generally aimed at providing the poor with access to rural land. The three most prominent types of legislation are as follows. Abolition of intermediaries. In the years following Independence, all states adopted laws prohibiting intermediaries in rural land tenancy. As a result, 25 million ―superior‖ tenants became landowners or direct tenants of state-owned land. However, loopholes in the laws allowed landowners to evict many of the poorest tenants, and allowed many intermediaries – rather than the cultivators – to become landowners. As the new landowning group grew stronger economically and politically, it became a force of opposition against reform measures aimed at benefiting the landless. In the process of abolishing intermediaries, many states also simplified and clarified their land legislation and also redistributed some land to the poor. Legislation abolishing intermediaries is more important as an historical note than for its current relevance (Hanstad and Nielsen 2007; GOI 2009a). Tenancy reform. Following Independence, most states adopted tenancy reforms with the intention of eliminating and preventing exploitation of poor tenants by landowners. Some states prohibit tenancy outright, while others impose pro-tenant provisions that set minimum terms and maximum rents and give tenants the right to assume ownership of the leased land under certain conditions. The tenancy laws also give landlords the right to resume cultivation of their land under certain conditions, which permits landowners to evict their tenants, thereby undermining the intent of the laws. While more than 12 million tenants have gained title to the land they till, far more have been evicted by landowners who feared losing their land (Hanstad and Nielsen 2007; GOI 2009a). Land ceiling laws. These laws impose ceilings on the amount of land that can be owned by one person or family and provide a process whereby the state can acquire excess land and redistribute it to the poor. The ceilings range from 3.6 hectares to approximately 22 hectares, depending on the state. States have redistributed more than 2 million hectares of land, fully 20% of which has been in the state of West Bengal. The compensation landowners receive is minimal compared with market value of the land acquired by the state. In some states, beneficiaries receive the land free of charge; in others they must make payments that may equal the amount paid by the state. Generally, beneficiaries may not sell the land for a lengthy period (e.g., 10–20 years in Karnataka) or, as in West Bengal, are permanently prohibited from selling. In many cases, the ceiling laws have not resulted in a significant redistribution of agricultural land, as it has been relatively easy for owners to evade the laws (Hanstad and Nielsen 2007; GOI 2009a). Laws allocating state-held land to poor households. Many states have laws allocating Bhoodan land, wasteland and house-site land to poor rural households. Many allocations pursuant to wasteland legislation took place in the 1970s and 1980s; six states have now allocated 80% of state lands designated as wasteland. In addition, state laws providing house-sites to landless or land-poor rural households have benefited an estimated 4 million households nationwide (Hanstad and Nielsen 2007). The National Urban Housing and Habitat Policy (2007) guides policy on housing and basic services in urban areas. The policy seeks to promote sustainable development while ensuring an equitable supply of land, shelter and services at prices affordable for all (GOI 2007). States recognize religious and customary laws concerning inheritance and marriage, and these laws generally do not protect women‘s rights to land. States generally do not recognize customary law related to tribal land rights. Such customary rights have been trumped by laws placing forestlands in the hands of the government, as discussed below. Land reform legislation, with its emphasis on individual land ownership has, in general, undermined customary land rights and been of little benefit to ST communities (Hanstad et al. 2005). The most common tenure types in India are common law freehold and leasehold. Eighty-six percent of arable land is privately owned. Landowners include individuals, corporations, religious institutions, public charitable trusts and the government. Individuals may acquire land in freehold through purchase, inheritance or gift (Agarwal 2002; Martindale Hubbell 2008). There are significant restrictions on agricultural land leases, as described above. Non-agricultural leases exceeding one year must be in writing. As a result of these legal restrictions, approximately 90% of leased land is leased informally; such leases are usually oral and are never recorded in the land rights registry. While sharecropping is the predominant form of tenancy, tenancy arrangements vary considerably from state to state (Martindale Hubbell 2008; GOI 2009a). In West Bengal, sharecroppers receive substantial protection under the West Bengal Land Reforms Act, which prohibits some types of leasing and regulates others (such as sharecropping). The law gives sharecroppers special protections, including the permanent right to continued cultivation. This right cannot be transferred except by inheritance. The law specifies the allocation of the crop between owner and sharecropper, as well as the circumstances under which the sharecropper can lose his or her rights. Although initial implementation of the Land Reforms Act was not successful, later legislation closed loopholes and achieved better results. The government also launched a campaign to register tenants and educate them about their rights, which proved important to successfully implementing the law (Hanstad et al. 2005; GOI 2009a; Banerjee et al. 2002). In urban areas, the following types of tenure exist: (1) legal housing on land held in secure land tenure; (2) short-term, but strong, de facto tenure; (3) weak de facto tenure security, including tenure security based principally upon the receipt of basic public services; and (4) insecure tenure, in which a slum occupies land reserved for public purposes, is small in size, or is newly established (Mahadevia 2010). Customary laws related to land tenure are discussed in the section on Land Administration and Institutions. Land can be acquired in India through purchase, inheritance and operation of various state land distribution programs. Land ceiling laws, discussed above, impose ceilings on the amount of land that can be owned by one person or family. The government is permitted to take the land and distribute it to landless or marginal families (Hanstad and Nielsen 2007; Deininger 2007). India has a dual land recordkeeping system that includes national and state laws governing a deeds registration system and state-level laws establishing cadastral-based records of land rights for revenue purposes. Together, they form a fairly comprehensive, decentralized and functional land recordkeeping system. However, the parallel systems are inefficient, as the records maintained by the two systems are sometimes inconsistent. The land transfer system is costly and slow. More significantly, the land records maintained do not constitute land title, only evidence of title. Overall, this dual system often does little to enhance tenure security and in some cases, actually renders land tenure less secure. The system often presents an inaccurate picture of landholdings on the ground, due to a large number of unrecorded transactions (Hanstad et al. 2005; GOI 2009a; Haque 2000). To register a land-sale transaction in India, the parties must complete six procedures, a process which takes an average of 45 days and costs an average of 7.5% of the value of the property. The procedure for registering property is as follows: (1) visit the office of Sub-Registrar of Assurance to check for encumbrances; (2) prepare the final deed; (3) pay the stamp duty on the final sale deed; (4) execute the final sale deed before two witnesses; (5) submit the sale deed and other required documents to the Sub-Registrar of Assurance; and (6) apply to the municipality to update the property title. India ranks 105th out of 181 countries with regard to the relative ease of registering property transactions (World Bank 2009a). Urban slums have varying degrees of legal legitimacy and in some cities are classified as either ―notified‖ or ―non-notified.‖ The former category is recognized by the municipal authority and has quasi-legal status, while the latter has no legal status. Notified slums qualify for basic public services and are eligible for inclusion in urban development programs. In contrast, non-notified slums do not qualify for programs because such programs might grant the residents of the slum de facto tenure. Notified slums have a degree of tenure security, while non-notified slums have very insecure tenure (Mahadevia 2010; UN-Habitat 2003). Resettlement and relocation colonies. These settlements were initially designed to house residents evicted from squatter settlements. While tenure terms vary, many households hold 10-year licenses that permit them to reside on the land. Licensees may not sell or lease their land, though these conditions are rarely enforced and land sales are common in some areas. There have been few evictions or relocations from resettlement and relocation colonies. Unauthorized colonies. These settlements are located on land zoned for agricultural use. Original settlers purchased land legally, though subsequent sales have been made through power of attorney, which circumvents the required stamp duty. Risk of eviction from these settlements is perceived to be low. Rural and urban villages. In Delhi, there are 142 designated urban villages and 226 rural villages. The villages maintain land records, and residents do not face eviction, though land title may be difficult to trace. Tenure in these areas is secure. State and city governments have demolished hundreds of slums over the past two decades in India, resettling tens of thousands of evictees on the urban periphery. Often, the impetus for demolition is new development or city ―beautification.‖ In 2010, the government destroyed a densely populated slum in Delhi, evicting an estimated 2000 residents. In Mumbai, the state and city governments evicted more than 300,000 people from slums between 2004 and 2005. In Kolkata, the state and city governments forcefully evicted 75,000 people from canal-side settlements in 2003. In most of these cases, the government has evicted residents without prior notification and with no compensation for lost property, and has deprived residents of access to their livelihoods (Wade 2010; UN-Habitat 2007; Dorairaj 2009; Duncan 2007; ACHR 2004). In rural areas, state and national governments have evicted over 21 million people for development projects, such as dams. More than half of these people have been members of ST communities (IDMC 2006). GOI and state policies, as well as armed conflict by the Maoist Naxalite movement (which emerged in West Bengal in the late 1960s and has expanded considerably since that time), have rendered ST land rights insecure in many parts of the country. Legislation governing land use by members of ST communities has frequently trumped unwritten customary laws governing land use by members of these communities. Large-scale migration of non-tribals to ST areas is also associated with alienation of ST land to non-tribals. Also, the Naxalite conflict has displaced approximately 450,000 members of ST communities, with the result that rights to land they have left behind are now highly vulnerable to encroachers and competing claims. As a result of these factors, many families in ST areas and other marginal areas lack rights to land their communities have occupied for generations (Hanstad et al. 2005; Hanstad and Nielsen 2007; GOI 2009a; IDMC 2010). Women and girls have inferior rights and access to land in India compared to men. Despite some attempts to address this disparity through legislation, the national and state governments have not historically made broad efforts to close the gap. Research on women‘s land rights in India has also lagged (LRAN 2003b; Hanstad and Nielsen 2007). According to legislation, women have the same right to own land as men. However, despite legal protections and efforts at reform, such as policies and programs encouraging joint titling, women‘s land rights remain largely insecure. Less than 10% of privately held land nationwide is in the name of women. Land is rarely titled separately in the name of women or even titled jointly with the woman‘s spouse, and when it is, women‘s actual control over the land is often limited. Social and cultural practices exert pressure on women to cede ownership or control over land to their husbands or brothers. Rural women in particular have little access to or control over land. Eighty-six percent of rural women depend on agriculture for their livelihoods, yet women‘s access to and control of agricultural land is extremely limited (GOI 2000; Agarwal 2002; Hanstad et al. 2004; Hanstad et al. 2005; GOI 2009a). Under India‘s inheritance laws, women and girls generally do not have the right to inherit property equally with their brothers or other male heirs. Such laws include the Hindu Succession Act, the Muslim Personal Law and state inheritance laws. While some states, including Karnataka, Tamil Nadu and Andhra Pradesh, have enacted legislation that aims to create equal inheritance rights, these laws have been largely ineffective in practice. Widows and daughters often do not assert their legal rights, and this reluctance stems from a variety of social and cultural causes related to dowry, concerns about personal security and other factors (Hanstad et al. 2005; GOI 2009a). Women also lack equal land rights under marriage and divorce laws. Although dowry is illegal, the practice is widespread, and a daughter may lose her inheritance because communities consider that dowry and wedding costs paid by her family represent the daughter‘s share of family assets. Land purchased by the family during marriage is presumed to be the property of the husband unless the wife‘s name appears on the title. None of the laws governing marriage or divorce give the wife ownership rights to any land in the event of divorce or separation (Hanstad et al. 2005). Previous land reform efforts have largely failed to strengthen women‘s land rights. Although the post- Independence central government directed states to title reallocated land jointly to husbands and wives, or individually to women, this rarely happened. First, most states did not include this directive in their land allocation programs. Second, even when the states did include these directives, they rarely implemented them. In recent years, however, the state of Karnataka has directed, with apparent success, that officials title housing benefits to women individually (Hanstad and Nielsen 2007). In tribal communities, tenure insecurity and displacement may affect female household members more than male household members. Because women in many ST communities depend on forest and land resources for their household work, their social status and their control of community resources, the loss of these resources often affects them more than the loss affects men (LRAN 2003b). Under the Land Registration Act (1908), land registration is controlled in each state by an official with the title of Inspector General-Revenue. In each district, an appointed Registrar presides over the District Registrar‘s office. A Sub-District Registrar is responsible for registering land transactions in each sub-district. Each state has its own land-records legislation and administration. The states generally have their own institutions overseeing land-record maintenance and tax collection, survey and settlement, deed registration and dispute resolution. In most states, land administration falls under the jurisdiction of the Revenue Department. A few states have separate departments or programs charged with implementing land reform measures. Examples include the West Bengal Land and Land Reforms Department and the Indira Kranthi Patham program in Andhra Pradesh (Hanstad et al. 2005; GOI 2009a). Generally speaking, land administration institutions in India are perceived to be inefficient, mismanaged, unreasonably costly, and prone to corruption (Deininger 2007; Hanstad et al. 2004; GOI 2009a). In ST areas, customary laws traditionally dictated the use and control of land. This was and still is especially true in the states of northeastern India. Under customary law, the village chief or elders typically controlled land on behalf of the community and resolved land disputes. However, laws governing the use of forest land and laws requiring the registration of land ownership have undermined customary practices and communal land ownership. Survey and settlement laws and procedures rarely recognize customary land rights (Hanstad et al. 2005; GOI 2009a). Relative to per capita GDP, non-agricultural land in India is the most expensive in the world. Foreign Direct Investment (FDI) is prohibited in farming, and foreigners are prohibited from owning farmland (Deininger 2007; USDOS 2009). Registering a land-sale transaction in India takes an average of 45 days and costs upward of 7% of the value of the property (See above, Securing Land Rights) (World Bank 2009a). Tenancy laws either prohibit or greatly restrict new agricultural tenancies and sales. Such laws: limit the amount of rent that can be charged; regulate the type of property rights tenants receive; set a minimum duration for the lease; and allow the owner to ―resume‖ personal cultivation and thereby terminate the lease. During the period of tenancy reform, the level of leasing in formal rental markets declined substantially. India‘s National Sample Survey Organisation (NSSO) recorded a decline in leasing from approximately 20% in 1953–54 to 12% in 1971– 72, to 8.3% in 1991–92. Although India‘s Agricultural Census has also kept some estimates of lease arrangements, these are not considered accurate since they are based on land records, and agricultural tenancy is neither legally recognized nor recorded. There is significant evidence of a vast informal land-rental market for which statistics are unavailable (Deininger 2007; Hanstad and Nielsen 2007; Haque 2000). The laws of many states restrict the ability of land-reform beneficiaries to transfer land they receive from the state. Some states prohibit transfers, others allow them only after a specified period, while others require approval by the local land-administration authority prior to transfer. In addition, many states prohibit sales of land from ST members to non-ST members (Hanstad and Nielsen 2007; Dieninger et al. 2007). Mortgage-secured loans represent the equivalent of only 2.5% of India‘s GDP, a very low rate of lending compared to that found in most developed countries (25–60%). Although commercial banks have become more active in writing home mortgages over the past decade, most housing investment is made informally, outside the organized financing sector. Loans for housing, including the household land plot, generally require a 24–46% down payment, precluding access for many low-income households (Economy Watch n.d.; Economic Times 2010). 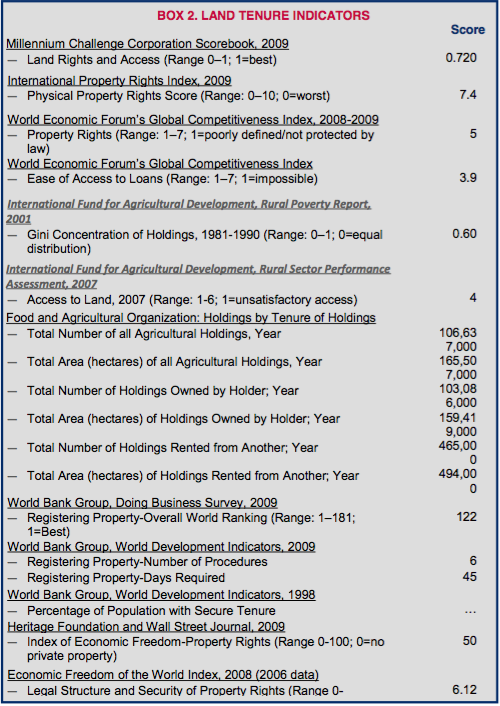 A World Bank study analyzing land sales between 1982 and 1999 yielded several outcomes. First, land-sales markets were less active than rental sales markets. Second, land sales increased as economic growth increased. Third, land-market participation by ST members was uniformly low. Fourth, distress sales for poor households were very common, pointing to limited access to credit and household subsistence constraints as primary motivators for sales. Fifth, land sales generally increased the landholdings of the labor-rich, while decreasing the holdings of those with low labor capacity and/or lower per capita landholdings than buyers. This pattern resulted in a net increase in productivity and wealth among buyers and sellers. Sixth, the land purchase market was considerably more active in the south than in the north. Seventh, a significant number of transactions took place outside formal market channels. The study also noted high transaction costs for land sales, especially through application of the stamp duty (requiring more than 10% of the land value) (Deininger et al. 2007). The government may use compulsory acquisition powers to purchase privately held land pursuant to the Land Acquisition Act of 1894 (LAA) if such land is required for a public purpose. ―Public purpose‖ is broadly defined and includes land for villages and towns; development projects of state-owned companies; distribution of land to the landless poor; health, education and welfare needs; and any development scheme sponsored by government. Land that the government acquires under the law can be transferred to private developers, which frequently happens. The property owner is entitled to receive the property‘s fair market value on the date the acquisition is announced. The law has made it easy for the government to obtain land. Land taken under the LAA (and under the Special Economic Zones Act, described below) has often resulted in payment of little or no compensation to the owners or occupiers of the land (Hanstad et al. 2005; Deininger 2007; Hanstad and Nielsen 2007). An amended version of the LAA, entitled the Land Acquisition (Amendment) Bill, was passed by the Lok Sabha (the House of People, or lower house of Parliament) in February 2009. Among other things, the bill intends to: reduce involuntary displacement; provide greater compensation and an improved legal process to those whose land is taken; narrow the definition of ―public purpose;‖ and limit the circumstances whereby private land can be taken for transfer to private developers (GOI 2010a; Indiaserver 2009). Between 2005 and 2009 the GOI entered into hundreds of contracts with private companies for mineral exploitation and processing, as well as infrastructure projects such as dams and power plants. From 1999 to 2009, such projects displaced an estimated 160,000 people in the states of Andhra Pradesh, Chhattisgarh, Jharkhand and Orissa. It is unclear whether and to what extent the government compensated displaced communities (IDMC 2010). Foreign investment and industrial development in India has been facilitated by the creation of Special Economic Zones (SEZs). SEZs are established largely to attract foreign investment and expand Indian exports. SEZs are primarily governed by the Special Economic Zone Policy of 2000 and the Special Economic Zone Act, 2005. SEZ investors can receive financial and infrastructure benefits, as well as land on which to operate their business. Projects are developed in conjunction with the central or state governments, or a combination of both. As under the LAA, land acquired by the government for SEZs has led to large-scale involuntary displacement of landowners and land occupiers, and substantial conversion of agricultural land to non-agricultural use, especially in ST areas (GOI 2009a; GOI 2009c). Land reform legislation enacted by states in the years following Independence authorized the government to obtain land through compulsory acquisition in order to redistribute land from large holders and intermediaries to the landless and land poor. Under land ceiling laws, for example, state governments confiscated land from large holders, paying a negligible price relative to the land‘s market value. However, land ceiling laws permit the landowners to determine which area of their land in excess of the ceiling the government will take, retaining the most valuable land (Hanstad and Nielsen 2007). Land disputes are an enormous problem in India. Perhaps 8 million of the 20 million pending civil cases in India as of 2000 pertained to land. Cases drag on for years. One study showed that land disputes affect 28% of all plots in peri-urban environments in Andhra Pradesh. Much of the land that the government has declared to be in excess of established ceilings remains undistributed while litigation is pending. In addition, the prohibition against transfers of ST land to non-tribals has created a substantial number of land disputes (Deininger 2007; GOI 2006; Hanstad and Nielsen 2007). Sometimes violent protests have delayed development of industrial projects. Land acquired by state governments for SEZs has been especially controversial and has sometimes led to violence. In West Bengal in 2007, the state government sought to acquire land for a petrochemical plant. Farmers unwilling to give up their land formed a resistance group supported by some political parties and nongovernmental organizations. A confrontation between the farmers and police left 14 protesters shot dead and 71 wounded (Mahmood and Sengupta 2007; World Bank 2006a; Ramachandran 2007). Conflicts over forests and agricultural lands have occurred in the eastern and northeastern states of India. These disputes are rooted in longstanding inter-communal, ethnic and separatist conflicts. In ST areas, disputes related to the illegal alienation of ST land to non-tribals are common (Library of Congress 2004; HBS n.d.; Deininger 2007; IDMC 2010). In the central states, the Naxalite movement – an armed movement begun in the 1960s to protest landlessness – has gained momentum in recent years. Conflicts over land and mineral rights have displaced an estimated 450,000 members of ST communities. In mid-2010, this conflict affected 20 of India‘s 29 states; the worst-affected states are Chhattisgarh, Jharkhand, Orissa and West Bengal. The GOI mounted an offensive titled Operation Green Hunt against the insurgents in 2009, causing the displacement of 100,000 ST members from Chhattisgarh state to Andhra Pradesh between mid-2009 and mid-2010. The Naxalite movement has taken hold in areas where poor lower-caste families reside in mineral-rich lands, and the movement has leveraged perceived injustices related to government sale of land and mineral rights to private companies. The Naxalites seek to persuade or coerce landless ST families to oppose the government and its plans for industrialization of the area. Civilians have often been caught in the crossfire during violent clashes between government and Naxalite forces (Ramesh 2006; IDMC 2010). India‘s land-reform efforts have had very limited success. India‘s rural poor generally have not seen improvements in their tenure security or improvements in their access to land. Land-ceiling laws are easily evaded by landlords and have not resulted in redistribution of significant amounts of land to the poor. Tenancy reform laws have done little to enhance tenure security among the poor and, in many respects, have made it harder for poor families to access land through lease (Hanstad et al. 2005; GOI 2009a). For many years rural poor families have been able to obtain a modest house under the centrally funded Indira Awas Yojana (IAY) rural housing project. In 2009 the GOI Ministry of Rural Development added a land purchase component to the program that will provide 25% matching funds to states for the purpose of purchasing 1/10-acre (approximately 1/20- hectare) house-and-garden plots on which the IAY houses can be built. In 2010 the central government appropriated approximately US $220 million to implement this plan over five years. Several states, including Karnataka and West Bengal, have instituted their own house-and-garden plot programs (Rajput 2007; GOI 2010b). In 2009, the GOI launched an affordable housing scheme in New Delhi. Through the scheme, three- and four- bedroom apartments will be sold at affordable prices. Initially, the units will be available to public sector employees. Eventually, the units will be available to the general public (Singh 2009). The GOI and some state governments have implemented programs intended to improve women‘s land tenure security. Prominent examples from Andra Pradesh include: (1) the Andhra Pradesh Scheduled Caste Finance Corporation, which provides subsidized loans to landless women to fund the purchase of agricultural land to be titled in their names; and (2) the Indira Kranthi Patham program, which previously included a land purchase program that helped poor rural women purchase an irrigated ―micro-plot‖ measuring 1/2 to 1 acre (or 1/4 to 1/2 hectare) (Agarwal 2002; DRDA 2008). The GOI has undertaken slum improvements, including: provision of basic public services and in situ development of slum settlements; improving the tenure security of the urban poor in informal settlements and providing access to low-cost housing; and empowering the urban poor through community development projects. In 2010, the Finance Minister allocated Rs 12.7 billion (US $285 million) for slum development. There is no common approach to slum improvement or redevelopment, and projects vary across India. In Delhi, relocated slum dwellers receive a 150-square-foot house, often on the urban periphery. In Mumbai, families receive a 300- square-foot house, which they cannot mortgage. In Kolkata, slum dwellers live perpetually as tenants until they are eventually relocated from the city. In all of these schemes, the maximum tenure security is 30 years (UN- Habitat 2010; Jog 2010). Through the Slum Rehabilitation Authority (SRA), the state of Maharashtra is currently undertaking more than 400 slum upgrade projects in Mumbai. These projects are spread throughout the city and are contracted to private developers. Dharavi – a highly populated slum located in Mumbai – is undergoing a redevelopment project in which slum dwellers whose names appear on the voter list will receive a 225-square-foot house in or near the slum. The scheme includes plans for improved roads, electricity, water supply, playgrounds, schools and medical centers. The rehabilitation project is expected to take five to seven years (SRA n.d.). The Delhi Master Plan 2021, developed in 2007, paved the way for the regularization of over 1500 unauthorized settlements in Delhi. The Plan‘s stated intentions are to concentrate and redevelop settlements, thus creating space for the urban poor in the capital. However, the Plan also allows for commercial development in these settlements, though developers are required to reserve a portion of housing for low-income households (India Housing n.d.; DDA 2007). USAID has made no land-related investments in recent years. The World Bank has provided technical assistance on land acquisition and resettlement procedures in certain areas of the country. The Bank has also provided substantial support for the Indira Kranthi Patham land program in Andhra Pradesh. This program included a land purchase component and a legal-aid program to assist poor rural women and their families to solve land-related legal problems (World Bank 2008; DRDA 2008; Hanstad and Nielsen 2007). The World Bank currently supports the Citywide Slum Upgrading Plan for the Heritage City of Agra (US $500,000), which is expected to run from 2010 to 2014 and aims to improve the environmental conditions in the city‘s slums. The World Bank also funds the Karnataka Municipal Reform Project (US $3 million, 2009-2012), which supports municipal investment in slum upgrading (World Bank 2010b; World Bank 2009a). The Asian Development Bank (ADB) supports Indian cities and states in promoting inclusive urban development. An ADB US$1 million project has run from 2008 to 2010 and includes capacity-building for slum upgrades (ADB 2008b). India has sizeable water resources, but these vary widely by season and region. Per capita water availability in India has fallen dramatically since Independence. Water supply per capita was 1902 cubic meters in 2001, but is expected to decline to 1401 cubic meters by 2025. Demand for water has grown and will continue to grow along with population, industrialization and urbanization. Agriculture, which relies heavily on irrigation, annually consumes more than 86% of India‘s water (FAO 2010a; Kumar et al. 2005; World Bank 2009c). Ninety-five percent of the urban population and 79% of the rural population have access to an improved water source. Access varies greatly by region. Despite this relatively high rate of access for urban areas, slums often face water shortages. While some slums have public water sources, these sources are only useable for a few hours daily. The GOI cites lower estimates for access to organized, piped water supply: approximately 71% in urban areas and 9% in rural ones. The rest of the population relies on untreated surface or groundwater. According to the government, inadequate access to sanitation and safe drinking water is the main reason for prevailing ill-health and morbidity levels in the country (UNESCO 2006; Duncan 2007; GOI 2001b; GOI 2009b). Water in India comes primarily from rainfall and Himalayan mountain snowmelt, although a significant amount of India‘s water also comes from neighboring countries. The country‘s rivers fall into four groups: (1) those originating in the Himalaya region and flowing continually due to snowmelt and heavy monsoon rains; (2) rainfed rivers in the Deccan plateau, some of which do not run year-round; (3) short coastal rivers which generally are dry a portion of the year; and (4) the rivers of western Rajasthan (FAO 2010a). Water supply is a serious problem. Extraction of groundwater exceeds natural recharge in many areas of the country. Unregulated groundwater-pumping drains utility resources and depletes water tables across the subcontinent. Groundwater levels in some areas are far below levels recorded in the 1970s. Per capita water availability in India is expected to decline to as little as 1/30th of the per capita availability in the United States (USAID 2002; PACS 2005). India‘s irrigation infrastructure is the largest in the world. The total area equipped for irrigation is estimated at 61.9 million hectares. However, irrigation and water supply methods in India are generally inefficient. It is estimated that the GOI will need to increase irrigation efficiency to 50% in surface water systems and to 72% in groundwater systems by 2025 in order to meet domestic food needs. India has made a substantial effort to improve its irrigation infrastructure through large public works such as irrigation system rehabilitation (FAO 2010a). As a result of excessive irrigation-use combined with overuse of fertilizers an estimated one-third of all irrigated land has been degraded through water-logging and salinization, and 7 million hectares have been abandoned (GOI 2009b; Kushwaha 2008). Water quality is also a major problem in India. Water quality is negatively affected by industrialization, agrichemicals, erosion, soil degradation, domestic pollution and wetland degradation. By the time surface water reaches the user, its quality is often severely degraded. The combined intensive use of irrigation and fertilizers has also contributed to groundwater contamination in many parts of the country (FAO 2010a; GOI 2009b; Kushwaha 2008). According to the GOI, poor policy choices are largely to blame for the overuse of water (and fertilizer). Such policies have included: highly subsidizing surface water for irrigation; subsidizing prices for electricity used in tube-well irrigation; and directly subsidizing chemical fertilizers (GOI 2009b). The legal framework for water rights in India includes the Constitution, national and states laws, common law, human rights principles as recognized by courts, and unwritten local norms. This framework is complex, overlapping and often contradictory (Cullet 2007). The Constitution of India gives states the right to control and regulate water, except in interstate rivers. The Constitution also mentions water in the context of municipal planning, relations between the GOI and state governments, parliamentary adjudication of disputes involving interstate rivers, taxation of water resources and India‘s territorial waters. Also, the Indian Supreme Court has ruled that the right to life, as established in the Constitution, is the basis for a ―right to water‖ for all people. This human rights overlay, although not yet broadly implemented, has in some cases taken precedence over longstanding common law rules that give preference to individual control of water resources (GOI 2008c; Cullet 2007). Although the Constitution grants states exclusive power over most aspects of the water supply, some exceptions exist. First, the Constitution reserves the power of the central government for: (1) establishing legislation on the use of interstate rivers; and (2) establishing legislation on adjudication of inter-state disputes over water. The Inter-state Water Disputes Act (1956), for example, establishes special tribunals for this purpose. In addition to these Constitutional exceptions to the states‘ control over water, the national government has carved out additional areas for legislation due to recognized need. The most important of these is national control over water quality and water pollution. The Water Act (1974), for example, granted authority to water boards to prevent and control water pollution. National legislation also governs development of major hydroelectric infrastructure, such as dams (Cullet 2007). At the central level, the most comprehensive water management document is the National Water Policy (NWP), adopted in 1987 and revised in 2002. The NWP recommends water-use planning based on river basins, and requires all Indian states to develop a state water policy within the framework of the national water policy. The NWP also prioritizes drinking water, followed by irrigation, hydropower, navigation, and industrial or other uses (FAO 2010a). States control most aspects of water use through legislation. State laws differ. In most states, legislation gives the state control and even direct ownership over surface water. State legislation sometimes conflicts with customary laws and local norms, which often give ownership rights over water resources to individuals who own the land on which the resource is located (Cullet 2007). At the local level, groups have developed their own rules to regulate access to water (for irrigation and domestic use) from human-built water sources, such as tanks. These norms are usually unwritten and are often based on caste lines. They run parallel to the formal laws, and are often not acknowledged or taken into account in the formation of new legislation (Cullet 2007). Under the Constitution, no person shall be restricted with regard to the use of wells, tanks and bathing ghats (steps leading down to a body of water). Courts have also derived a universal right to water from the Constitutionally established right to life. This evolving human rights standard, however, conflicts with state legislation and common law principles granting individuals exclusive use-rights to water (GOI 2008c; Cullet 2007). The GOI controls development and regulation of interstate rivers, and state governments control all other water supplies, including irrigation and canals, drainage and embankments, water storage and water power (PACS 2005; FAO 2010a). In India, legislators have not created a uniform system or process for ensuring secure and enforceable water rights (World Bank 1999; PACS 2005; Cullet 2007). Surface water. States typically grant use-rights to people who own the land lying beneath the water. According to common law principles, surface water belongs to landowners per a riparian rights system (riparian owners share rights to the surface water equally with other riparian owners, in undiminished flow). The rights of bulk users, including water user associations, vary by state (PACS 2005). Groundwater. Neither the central nor state governments have laws clearly defining groundwater rights. Under common law, owners and occupiers of a piece of land have the right to collect and use groundwater. It is customarily accepted that landowners own the wells on their land. Others have no right to extract water from these wells or restrict use by the owner. Despite the landowner‘s legal control of all groundwater, in the drier areas of India communities have historically considered the control of wells to be shared by caste or community groups. Social norms have dictated that all have a right to drinking water, irrespective of caste (PACS 2005; Cullet 2007; Moench 1998). The Ministry of Water Resources establishes policy guidelines and programs for water resource development. Within the Ministry, the Central Water Commission assists with management of state level water resources. The Ministry of Agriculture is responsible for irrigation projects. Customary water management practices exist across India. These practices differ by region. The power of customary water authorities has diminished since Independence, as legislation gave control over many water resources to the states. Traditional water-tank infrastructure and canals have degraded, and customary water management knowledge has increasingly been lost (UNESCO 2006). At the national level, the GOI is engaged in river management, flood control and irrigation projects. Between 2008 and 2009, GOI projects included a survey of the Kosi High Dam, embankment extensions for several rivers and maintenance of flood protection works. The GOI is also engaged in groundwater management and regulation, flood forecasting, development of a water resources information system and water infrastructure development (GOI 2009d). State governments have provided heavily subsidized water to the agricultural sector. These policies have caused inefficiencies in both water and power generation (USAID 2002; GOI 2009b). In 1994, the GOI adopted guidelines for watershed management and development. One objective was to ensure that water resources are developed to benefit the most disadvantaged sectors of society, including women. The guidelines recommend an emphasis on community-based organizations, such as women‘s self-help groups. In practice, implementation of the guidelines has been of relatively little benefit to women (USAID 2002). USAID supports the GOI‘s capacity to deliver water and sanitation services. In the past, USAID supported programs that intended in part to improve groundwater management and urban water availability and sanitation. It continued its support of urban water programs through 2008 (USAID 2010a; USAID 2002; USAID 2010b). The World Bank funds numerous water-related projects in India focused on flood protection, dam rehabilitation, rural water supply and sanitation, pollution management and water resource management. Among the largest of these projects are: (1) Andra Pradesh Water Sector Improvement project (US$450.6 million), which will run from 2010 to 2016; (2) Dam Rehabilitation and Improvement project (US$437.5 million), which will improve the safety and performance of select dams throughout the country and run from 2010 to 2016; and (3) Karnataka Municipal Reform project (US$216 million), which will operate from 2006 to 2012 and will build government capacity to provide water and sanitation. Also, the Asian Development Bank has provided support for water resources management initiatives and added programs for rural water conservation (World Bank 2010a; World Bank 2008; ADB 2008a). India‘s approximately 67 million hectares of forest cover, featuring 16 major forest types, constitutes 22.8% of total land area. The most commonly occurring forest types are tropical dry deciduous, moist dry deciduous, tropical rain, hill and montane. Planted forests constitute 2.4 million hectares and produce teak, bamboo, acacia and eucalyptus (FAO 1997; World Bank 2009c; FAO 2010b). Forests contribute 1.7% to India‘s GDP. Wood products include processed products and paper. Non-timber forest products such as latex, gums, resins, essential oils, flavors and fragrances have the potential to support further economic development. An estimated 60% of non-timber forest products are consumed locally, and approximately 400 million people living in and around forests depend on the sale of these commodities for sustenance and supplemental income (FAO 2010b). Forest degradation is a serious problem in almost all states in India. Approximately 55% of forests are affected by forest fires annually. Other factors contributing to the degradation of forests include increasing population, the conversion of forests to other uses, encroachment by agriculture, grazing, disease and the collection of fuelwood. According to the World Bank, approximately 78% of all forestland is heavily grazed. The rate of deforestation has decreased significantly since the 1970s. The annual rate of deforestation in the 1970s was 1.3 million hectares, but decreased to less than 250,000 hectares from 1990 to 2000. This was due in part to the introduction of social forestry, replanting, and conservation values encoded in the National Forest Policy (FAO 2010b; World Bank 2006b; GOI 2001a). India is the largest consumer of fuelwood in the world. Ninety percent of forest consumption is in small timber and fuelwood. Fuelwood consumption in India is approximately five times higher than that which forests can sustain. Fuelwood meets 40% of India‘s energy needs. The use of fuelwood is particularly prevalent in rural areas, where 80% of people utilize it. In urban areas, 48% of people use fuelwood (FAO 2010b). The Constitution of India provides that the government shall strive to protect the environment, including forests and wildlife. Key central-level forest legislation includes: the Indian Forest Act (1927); the Wildlife Protection Act (1972); the Forest (Conservation) Act (1980); the National Forest Policy (1988); the Notification Re: Participatory Forest Management (1990); the Revised Guidelines for participatory forestry issued by the Ministry of Environment and Forests in 2000; and the Scheduled Tribes and Other Traditional Forest Dwellers (Recognition of Forest Rights) Act or the ―Forest Rights Act‖ (2006) (GOI 2008c; Hanstad et al. 2005; Global Forest Coalition 2010). The Colonial Indian Forest Act (1927) is the primary governing forest law in India. Under the Forest Act, the GOI owns India‘s forests, and the states serve as proprietors of the forestland and resources. The Forest Act categorizes forestland into forest types, which in turn define the rights and responsibilities of various persons (GOI 2009a; Global Forest Coalition 2010). Although the India Forest Act gave extensive control over forests to the states, a later constitutional amendment transferred authority to the GOI and led to the adoption of the Forest Conservation Act (FCA) (1980). Under the FCA, states may not divert or otherwise reclassify forestland without GOI approval. National guidelines issued in 1992 set forth the conditions under which forestland may be diverted to non-forest use. The most important condition is that the lost forest area must be replaced with forest area elsewhere. Adoption of the FCA considerably slowed diversion of forestland for other uses. However, the FCA eliminated or diluted community rights over community lands through the process of recording forest rights. The beneficiary of transferred forest rights was generally the GOI‘s forest management bureaucracy, whose powers to control land increased. Reclassification of large areas of forestlands deprived traditional forest dwellers of their rights to use and occupy the forested areas, without any meaningful attempt to clarify those rights (GOI 2006; Sarin 2005). In 1988, the GOI adopted a National Forest Policy. This policy involves local communities in protection and development of the forest. It introduced a Joint Forest Management mechanism, adopted by most states, with the goal of balancing forest preservation and rehabilitation needs with the demands for fuelwood and small timber requirements of the local (often ST) communities. Despite some progress under the JFM system, most forestry resources are still managed by the state rather than by local communities (FAO 1997; NFAP 2001; Hanstad et al. 2005; World Bank 2006b). The GOI enacted the Scheduled Tribes and Other Traditional Forest Dwellers (Recognition of Forest Rights) Act (2006) to recognize the traditional rights of the Scheduled Tribes and other traditional forest dwellers. The Act substantially shifted legal authority over forest resources from the GOI to local ST communities, and states that forest rights vest with traditional forest-dwelling communities. The Forest Rights Act provides a mechanism by which ST members can obtain secure title to land their families have occupied and farmed for three generations. The Act also provides for recognition of common property rights over forestlands. The law‘s mandate to decentralize authority over forest resources to the community level has proven controversial, with sharp divided debate between the National Ministry of Tribal Affairs and the Ministry of Environment and Forests over the repercussions of the Act on preservation of forest resources, according to USAID/India. The National Ministry of Tribal Affairs has stated that the National Forest Department has resisted the transfer of rights to local communities under the Forest Rights Act, settling less than 4% of the community rights claims under the Act in favor of local communities. To address the implementation issues and recommend necessary policy changes for future management of forestry sector and role of various agencies, a high level committee was constituted by the National Ministry of Tribal Affairs and the Ministry of Environment and Forests in February 2010, according to USAID/India. The final recommendations of the committee put forward a number of key policy interventions for successful implementation of the Act (GOI 2010c). To date, most states have not effectively or extensively implemented the provisions of the Act. It is unclear to what extent the law will be implemented over time (World Bank 2008; GOI 2009a; Acharya 2010; Sethi 2010; Global Forest Coalition 2010; NFFPFW n.d.). While the national government owns most forestry resources in India, states have control over some forests, and recent legislation (the 2006 Forest Rights Act) vested forest rights on ancestral lands with traditional forest-dwelling communities. Forests under the ownership and control of the state are known as Recorded Forests. Recorded Forests can be separated into three categories: (1) Reserved Forests (which fall under jurisdiction of the National Forest Department; (2) Protected Forests (which fall under jurisdiction of the national and state forest departments and include national parks and wildlife sanctuaries); and (3) Unclassed Forest (which fall under jurisdiction of communities and individuals, and include forests that are neither reserved nor protected) (NFAP 2001; FAO 1997; Global Forest Coalition 2010). The state government has the power to declare as Reserve Forest any government-owned forestland and wasteland, and any property over which the government has proprietary rights. The process for doing so entails notifying the public and considering claims to the land. Thereafter, all lands included in the proposed forest vest with the state. Once the state issues a notification that certain property is Reserved Forest, no rights can be acquired in or over the land, nor can the forest be used except as agreed to by the government (Hanstad et al. 2005; GOI 2009a). The state can declare any government-owned forestland and wasteland over which the government has proprietary rights (and which is not already a Reserve Forest) to be Protected Forest. Generally, all forest use is permitted in Protected Forests unless expressly prohibited. The government can make rules regarding the cutting, sawing, conversion and removal of trees and use of other flora and fauna found in the forest (Hanstad et al. 2005; GOI 2009a). Between 1951 and 1988, the net area of forestland under the control of the Forest Department increased by 26 million hectares. Most of this forestland was classified as Reserve Forest. In some cases, the process of reserving forestland was accompanied by the identification of forest users and recording of customary rights. In other cases, the reservation of forestland resulted in the eviction of communities from the forestland. A substantial portion of forest classified as Reserve Forest has been so classified without completion of the required survey and settlement procedures (Hanstad et al. 2005; GOI 2009a). State policies have had a significant impact on women‘s rights to forest resources, due to changes in forest management, loss of forest resources and changes in livelihoods. Because women depend highly on forest resources for their family‘s livelihood and their social status, they have become more economically, socially and politically marginalized as their traditional rights to the forest have diminished (World Rainforest Movement 2005). Within the constraints of national legislation, forests are managed in each state by a Forest Department. Each state Forest Department is led by a Chief Conservator of Forest (GOI 2006; GOI 2009b). The National Forest Department manages Reserved Forests. The National Forest Department and often the National Wildlife Management Board and similar state boards manage the Protected Forests. The Revenue Department manages the Civil Forests (also known as Revenue Department Forests). The National Ministry of Tribal Affairs and the Ministry of Environment and Forests are charged with implementing the Forest Rights Act (2006) (Hanstad et al. 2005; Sethi 2010). According to some observers, the National Wildlife Management Board has allowed the significant diversion of protected area lands over the past decade. Between 1998 and 2010, the Board purportedly allowed the transfer of nearly 8000 hectares of land out of protected areas. Of these, the Board declassified approximately 4500 hectares as protected, permitted over 2000 hectares to be cleared for mining, and allowed approximately 1000 hectares to be used for energy infrastructure, dams, roads or construction (Acharya 2010). The 2006 Forest Rights Act increased the authority of local communities over forest resources, and the GOI continues efforts to decentralize forest resource management through regulations and directives to the states. For example, in October 2010 the GOI‘s Union Environmental Minister directed state governments to move the Joint Forest Management Committees (JFMCs, the Forest Department‘s smallest, most grass-roots level unit) directly under control of the panchayati-raj (locally elected village council). While the JFMCs technically represented diverse stakeholders prior to this directive, they were headed by Forest Department officials. Now the JFMCs will be organs of the gram sabha (village general assembly), acting as standing committees for forest resource management (The Hindu 2010; Acharya 2010). The GOI has actively participated in discussions concerning the United Nations‘ Reducing Emissions from Deforestation and Forest Degradation (REDD) program. India has proposed a ―compensated conservation― approach, in which countries would be compensated for maintaining and increasing carbon stocks. Advancing the REDD agenda opens important questions about control of forest resources per the Forest Rights Act and other attempts to decentralize forestry management. Some observers have expressed concern that REDD will further compromise local communities‘ rights to control the forests (ICFRE 2007; NFFPFW n.d.). The World Bank funds the Improving Rural Livelihoods through Carbon Sequestration Project, which will encourage resource-poor farmers to raise tree plantations of carbon-rich tree varieties. This is a pilot initiative aimed at improving rural livelihoods through sustainable forestry. The US $6.76 million project will run from 2007 to 2018 (World Bank 2007b). The World Bank is expected to fund the Himachal Pradesh Watershed Management Project, which is currently in the pipeline. The US $8.45 million project will aim to sequester green house gases (GHG) by expanding forestry plantations on degraded lands held by small farmers. The proposed project is a subpart of the Mid-Himalayan Watershed Development Project. As a result, the project will be jointly implemented by the Mid-Himalayan Watershed Development Project, the Forest Department and the Gram Panchayat (World Bank 2007a). India‘s mineral resources include barite, bauxite, chromite, coal, iron, mica sheet, talc, pyrophyllite, aluminum, crude steel and manganese, the deposits or production of which rank among the ten largest in the world. Overall, India is a major mineral producer. Mining and quarrying accounted for 2% of GDP in 2005 (USGS 2008; Hill 2010). Coal mining accounts for 70% of India‘s employment in the mining sector. The largest coal producing company in the world is the state-owned Coal India Limited. Other large state-owned companies in India are active in steel, base metals and aluminum mining and production (IIED 2002). Most mining operations in India outside of the coal industry are small-scale. Fifty-seven percent of mines occupy 10 or fewer hectares, and an additional 23% occupy between 10 and 50 hectares. The government and mining industry believe that the mining sector has substantial room for economic expansion (Hill 2010). In southern Chhattisgarh, large companies have been purchasing land and mineral rights from the state government, in transactions that many local people do not view as transparent. These actions have provided political fuel for the Naxalites, armed Maoist insurgents (Ramesh 2006). Other conflicts have arisen over the development of power plants constructed to support mineral extraction and production, such as a power plant in the state of Orissa (IIED 2002). The mining sector has caused widespread environmental problems in India, including groundwater pollution, loss of agricultural and forestland, and damage caused by abandoned mines (Metha 2002). The GOI and state governments own and manage all minerals other than natural gas and petroleum pursuant to the Mines and Minerals (Regulation and Development) Act (1957). Natural gas and petroleum are governed by different laws. The GOI grants concessions of most minerals under the Mineral Concession Rules (1960). The states have their own rules for concessions of minor minerals. Development of minerals is also governed by the Mineral Conservation and Development Rules (1988) (GOI National Mineral Policy 1993). The National Mineral Policy (1993) opened up mineral exploration to the private sector. This policy also allowed foreign participation in mining joint ventures, generally limiting foreign equity participation to 50%. In 2006, the GOI removed limits on foreign participation in diamond and precious stone mining ventures, allowing 100% foreign ownership (GOI 2006; GOI 2008a). The GOI approved a new National Mineral Policy in 2008. This policy seeks: to reduce procedural delays which limit investment and technology flow in the mining sector; develop a sustainable, optimum utilization of the country‘s mineral resources; balance development with the goal of improving the life of people living in mining areas (located primarily in the less developed regions of the country, where ST communities reside); and deter environmental consequences of mining through the adoption of legal safeguards. The new policy has not yet led to adoption of amendments to the Mines and Minerals Act (GOI 2008a). The state governments own minerals located within their borders and are largely responsible for granting concessions for mineral exploration within their boundaries. Minerals located offshore are the property of the GOI (GOI 2008a). India faces significant problems relating to land acquisition for mining and stemming from the absence of a clear rehabilitation and resettlement policy for people affected by land acquisition and related mining operations. Mining companies rarely consult with local communities. The failure to satisfy local needs and concerns has led to confrontations, tensions and conflict, sometimes in the form of campaigns by civil society organizations and people‘s action groups that allege unjust mining practices. Other largely unaddressed issues include displacement, human rights violations, environmental degradation and health hazards (IIED 2002). At the central level, mineral exploration, excluding natural gas, petroleum and atomic materials, is under the control of the Ministry of Mines and the Bureau of Mines. Each state has its own body responsible for granting mineral concessions (GOI 2008a). The Geological Survey of India is principally responsible for geological mapping and mineral resources assessment. The Department of Ocean Development oversees seabed exploration, exploitation, mining and processing. Other agencies and government corporations involved in these tasks include Mineral Exploration Corporation, Directorates of Mining and Geology of the various state governments and various central and state public sector organizations (GOI 1993, as amended). The National Wildlife Board has authority to reject mining proposals in protected areas. Between 1998 and 2010, however, the Board reportedly accepted every mining proposal it considered, resulting in the clearing of over 2100 hectares of protected area for mining (Acharya 2010). The GOI has approved reforms to mineral extraction and development law, the most recent of which is the National Mineral Policy (2008). The policy seeks to reduce procedural delays, promote sustainable mineral development and balance development with the goal of improving the life of people living in the mining areas, most of whom are members of ST communities. The policy has not yet led to the adoption of amendments to the Mines and Minerals Act (GOI 2008a). The national Parliament plans to review a proposed new mining law (to replace the 1957 law), beginning in November 2010. The two primary goals of the legislation are: (1) to open up the mining industry to private investment (both domestic and foreign); and (2) to increase benefits that local communities derive from mining activities. The current draft law requires that mining companies share 26% of profits with local communities affected by the mining activities (or, an amount equivalent to the company‘s royalty payments in the previous year, if royalties exceed 26% of profits). This profit-sharing is in addition to normal taxes and royalties, and is strongly criticized by the mining industry. The draft law does not, however, provide local communities with a ―no consent‖ option, a point some environmental and human rights groups have criticized. Other provisions include: the option for mining companies to extend rather than renew their concessions permit; a new alternative form of license aimed at motivating investment for high-tech exploration. The new ―large-area prospecting license‖ would combine reconnaissance and prospecting licenses; and a simpler process for buying and selling concessions (Hill 2010). USAID has supported India‘s efforts to develop clean energy sources by providing assistance with through clean coal technology, efficient electricity distribution and rural electrification projects. ADB has supported large energy development projects. Other large bilateral and multilateral donors do not appear to have invested in the minerals sector in recent years (USG 2008; ADB 2008a).